Rangers chief executive Craig Mather has resigned from his post with immediate effect. In a statement to the stock exchange, the club also announced the resignation of non-executive director Bryan Smart. "The interests of the club are of paramount importance and I believe these are best served by me leaving the club," Mather told the Rangers website. 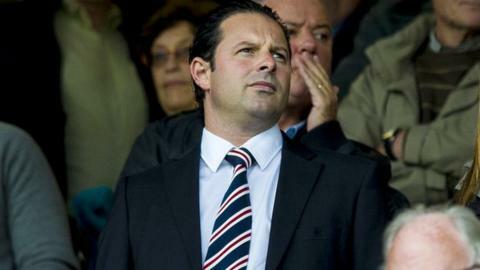 "I have enjoyed a very constructive relationship with [manager] Ally McCoist and wish him and the team every success. "I leave with my head held high and will remain as a shareholder and a supporter of Ally and his team. "I consider it to have been my privilege and I am certain that once the board is settled Rangers will be restored to the top of Scottish football. "I wish Rangers and the fans every success in the weeks, months and years ahead. I will continue to follow the club's fortunes and support the team which is playing an exciting style of football. In fact, I hope to return to Ibrox and take in as many matches as my time will allow." In the club's annual accounts, it was revealed that in the 13 months to June. "My short tenure as chief executive has been beset by incessant attempts to destabilise the operations of the club, all done supposedly in the interests of Rangers," added Mather. "Despite recent events and speculation, the facts of the matter are that the club is financially secure and in a far better place than it was a year ago. "Unlike most football clubs Rangers has money in the bank, no borrowings and this season we have assembled a squad which is capable of progressing through the leagues. "I had real faith in the rebuilding of Rangers and invested significantly in the club. Sadly, those who have been most active in upsetting the very good progress we have been making were not willing to do the same. "No individual is more important than Rangers and my departure will hopefully alleviate some of the pressure surrounding the club and herald an end to the current hysteria, which I believe most fans desperately want to see. "It is often forgotten that I put in £1m of my own money but I can assure everyone that it was never about the money for me." On the park, Rangers have won all of their Scottish League One matches so far this season and have progressed to the semi-finals of the Ramsdens Cup. The club statement to the stock exchange read: "The directors would like to thank both Craig and Bryan for their contributions to the club. "As a matter of priority, the company, working with its advisers, will now seek to strengthen the board, both to meet the standards required for an AIM company, and to achieve stability through a consensus amongst major shareholders, which can then be considered by all shareholders at the Annual General Meeting."